Meteorites don't always announce their arrival, but the one bearing down on Canada on Jan. 18, 2000, was not shy. Plunging toward the ground in a roaring fireball, it took aim at Lake Tagish in the British Columbia mountains and  this being winter  smashed itself into fragments on the lake's icy surface. 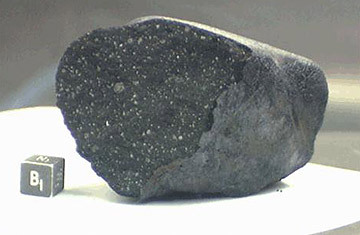 It wasn't until Jan. 25 and 26 that scientists could travel to the site and collect bits of what was once a meteorite measuring perhaps 13 ft. (4 m) across. Those fragments have been kept frozen to preserve any organic compounds that may have been riding aboard the rock when it crashed and are periodically subjected to scientific analysis. The latest of those studies was published this week in the journal Science, and what the new investigators reported was eye opening: biology may have been incubating on asteroids long before it arose on Earth. The elements that give rise to life are hardly unique to our planet. Hydrocarbons, the basic molecules from which known life is built, are made of nothing but hydrogen and carbon. Two other key players are oxygen and nitrogen  and all four of them are everywhere in the universe, often combining in interesting ways. "There's no doubt from astronomical observations that we can see organic compounds out there in space," says geologist and mineralogist Christopher Herd of the University of Alberta, the lead author of the new paper. "You can also cook them up on Earth." But if raw materials were all it took for life to exist, it would be everywhere. It's not, of course, partly because those extremely simple building blocks have to be processed into slightly less simple ones and on and on through various stages of refinement. Three of the most critical materials produced in this process are amino acids (from which proteins and peptides are made); monocarboxylic acids, a suite of hydrocarbons that readily participate in chemical reactions; and macromolecular clumps of organic material called kerogen. Bits of some of these prebiotic materials have been observed in meteor samples before, and Herd and his colleagues were thus not terribly surprised to find them in the tiny 0.4-in. (1 cm) samples of the Tagish meteorite that they studied. What was unexpected, however, was that they saw all the materials in various stages of development, from their simplest forms to their most complex ones. It was as if the scientists had discovered not only butterflies but also cocoons and caterpillars. "There was this linear correlation from one stage to the next to the next," says Herd. "We saw the organic materials through five different stages of sophistication." The Tagish meteor, Herd and his colleagues concluded, must have been operating as a sort of incubator, flying through space and cooking up increasingly elaborate organic compounds until it deposited them in British Columbia. On modern-day Earth, which is saturated with life, a few more organic materials wouldn't make much of a difference. On the original, barren Earth, they could have played a meaningful role  adding at least some extraterrestrial seasonings to the organic soup already bubbling here. Just how a dead rock flying through icy space could support such elaborate chemical processes is not clear, but Herd has a theory. The Tagish meteor formed the same way all the asteroids and meteors in the solar system formed: accreting out of the primordial swirl of gas and dust that also gave rise to the sun and planets. The oxygen and hydrogen in that cloud would have combined to create at least some water, which would also have been mixed into the matrix of the asteroid. And the gravitational heat generated as the rock was coalescing, coupled with radioactive materials onboard, would have kept the water warm and, in a sense, pulsing. "It could have operated almost like a hydrothermal cell," says Herd, "with water circulating through the asteroid. After a while, the heat would run out and that process would shut off, and you'd be left with different stages of organic materials." None of this means that true life could have arisen on asteroids; their warm phase would simply have been too brief. What it does mean is that biological processes may be taking place everywhere in the solar system and that some of the early chemical seeds may have been scattered on Earth. In other words, we have met the aliens  and they are at least partly us. An earlier version of this story said that DNA is made of amino acids; it has now been corrected to say that proteins and peptides are made of amino acids. See mankind's greatest explorations and adventures. See "Origin of Life: An Old Experiment Yields New Clues."